(Release Date: March 18, 2014)  Disney's 53rd animated feature has nothing to do with people stranded on a ski lift, but the studio has felt the need to repeat the same title, "Frozen," already used for Adam Green's white-knuckle 2010 thriller. A loose adaptation of Hans Christian Andersen's "The Snow Queen," this sumptuous, modernized but still very much classical, fable deserves its own identity, one that doesn't share its moniker with another terrific picture less than four years old. It is a derivative decision within a film otherwise teeming with its own radiant, imaginative vision. Headed by Chris Buck (2007's "Surf's Up") and Jennifer Lee (writer of 2012's "Wreck-It Ralph," making her directorial debut), "Frozen" reminds, if doesn't quite match, 2010's glorious "Rapunzel"-inspired "Tangled," right down to its fairy tale inspiration and delicious musical leanings. The latter element has been cautiously hidden from all advertising and promotional materialsa disappointing but unsurprising fact that makes its memorable, often touching original songs by Kristen Anderson-Lopez and Robert Lopez all the more special and welcome. In the idyllic ambrosial kingdom of Arendelle, royal sisters Elsa (voice of Idina Menzel) and Anna (Kristen Bell) are as close as siblings can bethat is, until Elsa's curious cryogenic powers inadvertently threaten little Anna's life. Their worried parents demand that Elsa suppress her abilities and Anna's memories of this life-threatening event be swept clean. Closed away much of the time in her room, Elsa drifts apart from Anna until their mother and father die in a tragic accident on the high seas. Three years later, Elsa has officially come of age and is all set to take over as queen when, on the day of her coronation, a contentious spat between sisters reveals to Anna and the entire community the powers she has kept hidden for so long. Turning Arendelle into a wasteland of eternal winter, a shamed Elsa flees from the kingdom. 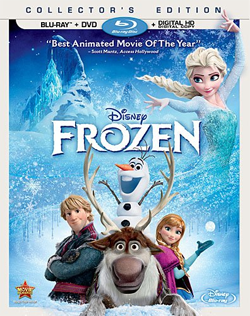 Desperate to find her and make things right, Anna sets off on a perilous trek across the snowy mountains, eventually joined in her journey by dashing mountain man Kristoff (Jonathan Groff), his reindeer Sven, and a cheerful mystical snowman named Olaf (Josh Gad) who dreams of experiencing summer. "Frozen" is lighthearted and funny when it wants to betrue to form for the best of Disney's animated films, humor derives timelessly from clever writing and keen character interactions rather than a stream of pop-cultural referencesbut its dramatic core is where it gets its strength and durability. In their tale of the untouchable bond between siblings, directors Chris Buck and Jennifer Lee (she also penned the screenplay solo) are touchingly empathetic to their well-wrought heroines. Anna might be the latest so-called Disney princess, but she is more charmingly awkward and feisty than prim and proper. She doesn't have all the answers and makes mistakes, hastily becoming engaged to Prince Hans of the Southern Isles (Santino Fontana) before she's gotten to know him. Her wintry voyage alongside Kristoff opens her eyes to not only what she is capable of as an independent young woman, but also to the possibilities set before her. As for Elsa, who is cast out of Arendelle by scared people who aren't yet accepting of those who are different, she symbolizes no less than anyone in the world who has been made to feel like they don't belong. The relationship between these two sisters could have been expanded upon, but what is here still rings true. A moving early song called "Do You Want to Build a Snowman?" affectingly sets up their connection and the details which gradually tear them apart. "For the First Time in Forever," a duet performed by Kristen Bell (2013's "The Lifeguard") and Idina Menzel (2007's "Enchanted"), playing Anna and Elsa, is beautifully written, while Menzel's solo on "Let It Go" after she has run away and begins to make a lonely new home for herself out of ice is the central showstopper. Bell's and Menzel's singing vocals are outstanding, but they also are just as vivid in their overall embodiment of these meaty roles. Jonathan Groff (2011's "The Conspirator") is affable and down-to-earth as Kristoff, while Josh Gad (2013's "The Internship") delightfully plays snowman Olaf, the character most destined to be the movie's breakout star. The pointless, image-darkening theatrical 3D presentation notwithstandingthe 2D version is the one to seek out,, and has thankfully been the only version included on its Blu-ray release"Frozen" joins the ranks of Pixar's "Monsters University" as one of the most impressively animated motion pictures of the year. State of the art and seriously gorgeous, the film is a snow-filled sight to behold, suitably frosty and ideal for the holiday season. Anna and Elsa are rousingly expressive as well, dual leads the viewer cares about and wants to watch. The main villain of the piece, the sniveling Duke of Weselton (Alan Tudyk), is less successful, not really given much to do and, envisioned as snooty, aging and small in stature, not at all threatening. The pacing also loses a little steam toward the end of the second act, the songs petering out and some business involving trolls worthy of the cutting-room floor, but it comes back strong in time for the sweet, emotionally satisfying finale. As 2013 quickly winds down, audiences in search of top-notch family fare that anyone of any age will be able to appreciate need not look any further. "Frozen" is a captivating entertainment. From the lush, glorious kingdom of Arendelle to the snowy peaks and cliffs which surround Elsa's icy new palace, the 1080p digital-to-digital transfer of "Frozen" brings the wow factor in a near-constant 102-minute dose. Simply put, this is a pristine and immaculate visual stunner, the richness of the computer animation and all that it entailsthe rapturous colors, the sharp lines, the details big and small that reveal themselves almost like Easter eggs for the durationlooking just as exquisite as its theatrical presentation under the best of circumstances. There is no edge enhancement in sight, no banding and, really, no weird technical anomalies at all. Audiences who watch "Frozen" in their homes will be in rapture throughout. This is just gorgeous. Fear not, audiophiles! The film's lossless 7.1 DTS-HD Master Audio is enough to make viewers believe they have left their home theater and entered into the fictional world on the screen before them. Bold, uncompromised and wholly immersive, the sonic range gushes out of every surrounding speaker, each one complementing the others with naturalism and real oomph. The songs, including "Love Is an Open Door" and highlight "Let It Go," sound wonderful, while background effects and dialogue only attribute further to the hypnotic majesty of the landscapes and aural planes the film creates. "Frozen" blew up at the box office, earning over a billion dollars internationally and capturing the appreciation and adoration of audiences of all ages. It is no surprise, then, that toys and other merchandising are plentiful, a sequel is being discussed, and even a Broadway musical adaptation is in the planning stages. Disney should have spent more time on the virtually shoestring bonus content on the disc, but at least it includes one absolutely priceless feature: the gloriously unorthodox "The Making of 'Frozen'," an infectious live-action musical number performed by Kristen Bell, Josh Gad and Jonathan Groff with a great little punchline. Running just three minutes twenty seconds, it is almost as worthwhile as the movie itself. Decked to the nines with top-flight A/V credits, "Frozen" on Blu-ray will be one that even casual high-def collectors will want to own. It isn't just recommended, but a must-have.